The ceramic buildings for the layout must be in relief - and not be simply painted tiles. One way of having raised features like window sills and pillars is through the addition of little strips of clay. 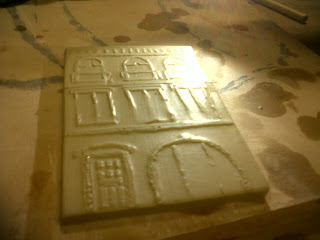 That's the technique I used to create the finished tile shown on yesterday's blog. I do fear that that was beginner's luck and that rather than by gaining skills and improving, I might just stand still and my subsequent creations may actually be less effective. Anyway, the new technique involves the painting-on of features onto a semi-dry slab of clay. 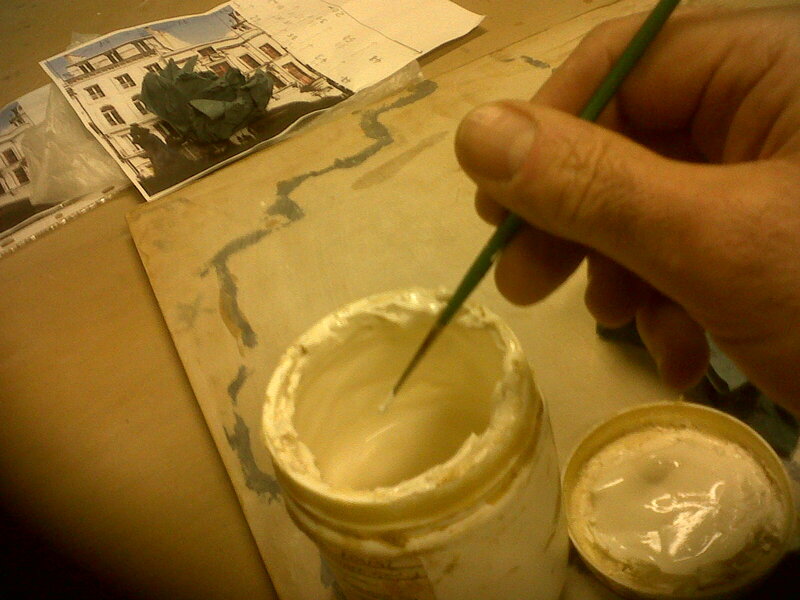 But, it's not paint that one uses but either wax-resist or shellac. This stuff dries after a few minutes and water-proofs the clay that is directly beneath it. 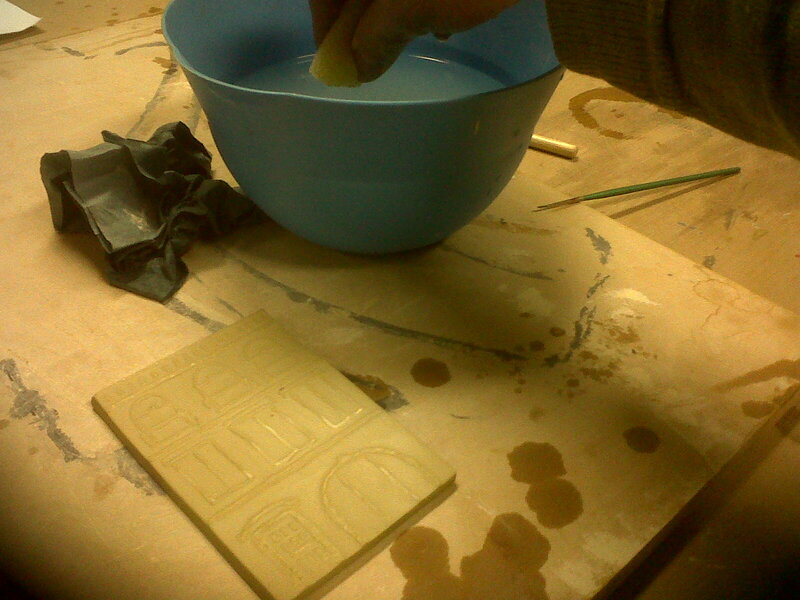 One then takes a damp sponge and rubs away the unpainted clay. This leaves the "painted" features standing proud. Hope these pictures explain this process. By the way, the lighting for these photographs was provided by a classmate who had an "app" on her phone which acted as a mini-floodlight. She also had a low-energy lightbulb "app"! Seriously! As I say, the class is very supportive of novices like me. 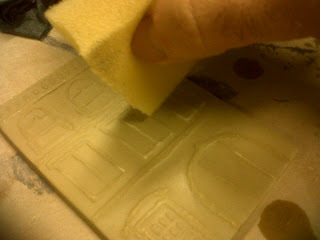 In fact, the technique of sponging required quite a lot of feel. The tutor did almost all of it in a matter of a minute. I then took over and rubbed-off or severely distorted 30% of the features. However, I applied more wax-resist to the damaged parts so hopefully the gist of the features will survive. 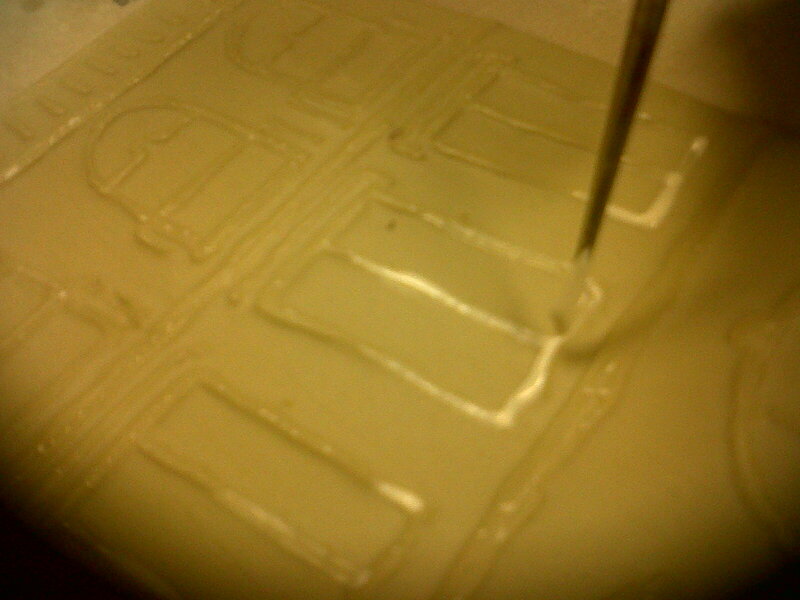 Not sure what the next step in the process is; presumably, getting rid of the wax-resist. Spent much of the day humming Eels tunes to myself. In my, it has to be said, ignorant opinion (I've never been an adept with the English language) the lyrics to the song "Hey Man!" are particularly good: simple but pointed. Basically, he seems to be saying that a person is only really living when they are tackling tremendous challenges or experiencing great satisfaction. Just treading water - which is what I do most of the time, and seek to do most of the time, it has to be said - is simply not living to the full. All of this philosophy is delivered in a jaunty style with a jaunty melody which, I think, emphasises the serious point he is making. Do you know what it's like to fall on the floor? Have you ever made love to a beautiful girl? Do you know what it's like to care too much?